We can’t wait to meet you and help you find the perfect wedding dress at Wonderland Bridal! Request an appointment by filling out the form below, or give us a call at 954-973-8695. Our knowledgeable stylists will guide you throughout your 90-minute appointment so you can find the dress of your dreams that also fits your budget! Wonderland Bridal now offers the ultimate wedding dress shopping experience. 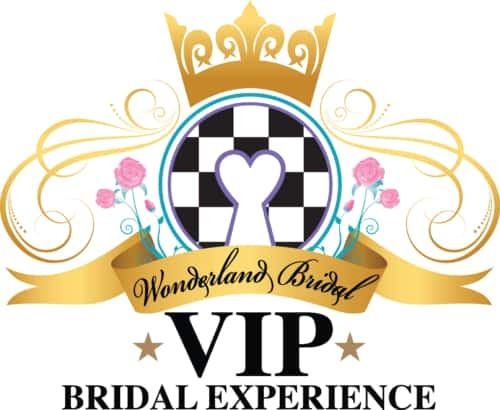 Introducing the VIP Bridal Experience. During this upgraded appointment, there are absolutely no distractions. The store will close its doors to focus on you and you alone! You will receive refreshments and lite snacks. Hair and makeup demos so you can get an idea of your bridal look. Enjoy 10% off on all accessory purchases made on this day. A super adorable Swag Bag filled with goodies and other wedding vendor promos exclusive to Wonderland. VIP Appointments can be rescheduled but not cancelled. There is a $250 charge for your VIP BRIDAL EXPERIENCE appointment due at the time of scheduling. $100 will be applied to the purchase of your wedding gown. © Copyright – Wonderland Bridal. All rights reserved.